A beautiful September fall day. It was a Saturday morning in September 2017 when we were on our way to hunt caribou in our favorite area. 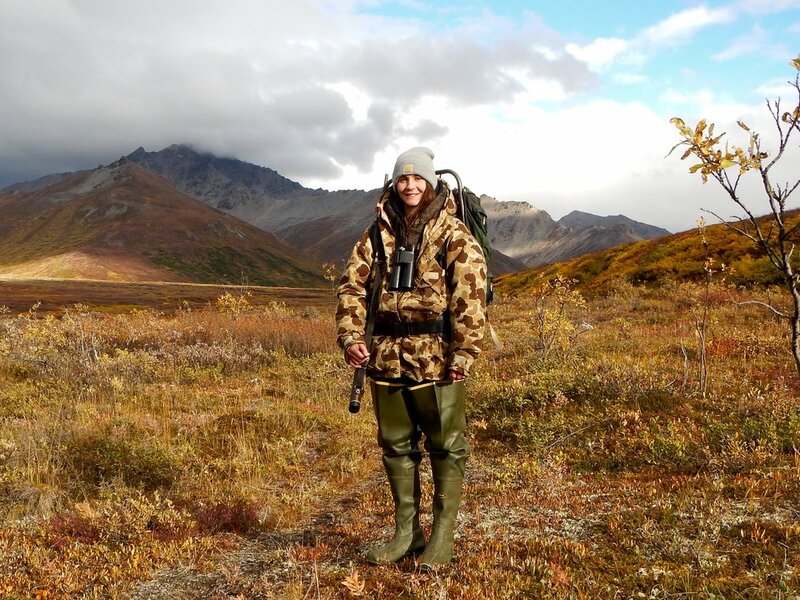 Rachel had drawn a caribou permit and had come up from school in Seattle for the hunt. It was Sagen, Rachel, Jared, Nathan, Nate (Jordan’s husband) and myself. This was Nate’s first hunting trip with us. Since he was a nonresident he was coming along to experience the fun and to help pack if need be. Sagen’s brother Thor and his kids Hannah and Jack and our good friend Steve Crim and his son Bryan had left on Friday afternoon and were going in first to set up a big camp. They had drawn two any bull moose permits. Thor had recently bought a giant 16x27 Montana Wall tent that they were going to use for cooking and sleeping. When we joined them we were going to set up my six-man Eureka Drawtite to sleep in. Since most of the caribou that we had spotted in the past were up the creek another six or seven miles we were going to set up our camp somewhere around there. Inside the giant 16x27 Montana Wall tent. Quite a home. The trip into main camp on our four wheelers went well. We had taken way too much gear and needed two trailers to get it all in. Once in main camp we thought we could condense the gear down to what we could tie to the four wheelers but we were wrong and had to use one of Thor’s Packrats to get everything in that we needed for our large spike camp. We spent the night at main camp and were on our way to the back of the valley by 10:30 or so the next morning. One of the reasons we used the Packrat instead of one of our homemade trailers was it was waterproof. We had to cross the creek at least twenty times while making our way to our camp site. Jared crossing the creek with our only 2 wheel drive four wheeler. We planned on setting up camp close to the tree line so we had trees large enough to use for the wall tent spanner and end poles. We found a great place to set up camp about six miles up the creek. After unloading the four wheelers Jared and Nate grabbed a couple of axes and took two of the big four wheelers back down stream to find at least five large 15 to 20-foot-long poles for the wall tent frame. We found good flat spots and set up the three sleeping tents. (L to R) Nate and Jared after their tree cutting exercise. Jared and Nate returned with some perfect poles so we set the wall tent up to cook in and to get out of the weather. 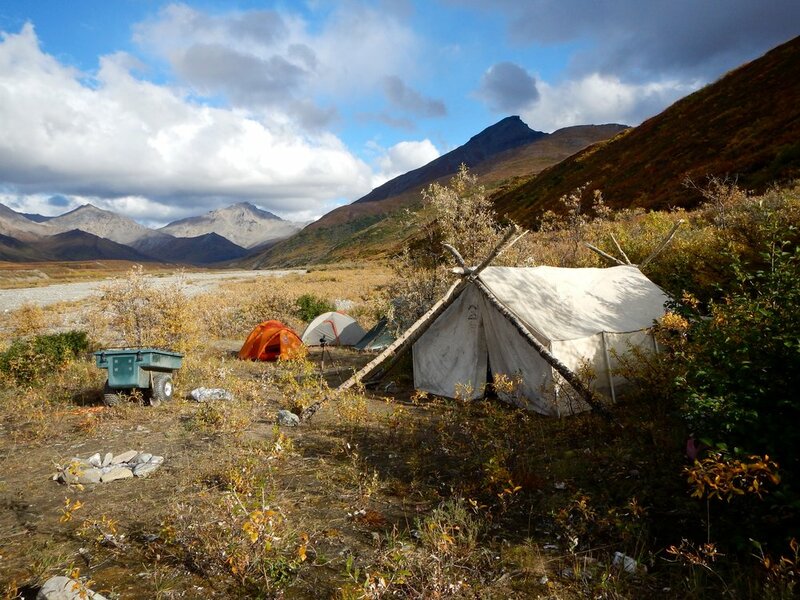 With a great camp set-up and a super spotting hill right behind it we were ready to glass for caribou. A beautiful setting for our camp. We woke to a beautiful sunny morning and while I was cooking breakfast Sagen was sitting in a folding chair spotting right from camp. After breakfast we all headed up the hill to get the best view of the entire valley. I love this time of the year with all the beautiful fall colors. Everyone was pretty excited at first but as the morning moved on the boys headed back down around the tents. Somewhere late in the morning I spotted a bull moose across the valley high on the hillside in a patch of willow. It wasn’t a big moose, somewhere in the 40’s, but we knew that didn’t matter because Thor and his gang had two any bull tags. The plan was if we spotted a moose one of us would go back down stream and tell the others. Sagen jumped on his four wheeler and headed down stream hoping that they had moved up the valley to another spotting hill closer to us. The rest of us stayed and got everything ready to head farther up the valley after he returned. The camp from the glassing hill. Around mid-afternoon everyone was getting anxious so we headed up the valley knowing Sagen would catch up when he returned. We made it to the fork in the creek and continued up the north fork another half mile or so and parked the four wheelers on the north fork side. Everything up the south fork was in a non-motorized area so we climbed the bank to spot in that direction. It was a great looking area for caribou. Nathan had taken his 386 B&C caribou up that drainage a few years earlier. Somewhere around 3 p.m. Sagen caught up with us. He told us that Thor and the gang were going to try to get their rigs up the mountain as close to the moose as possible. Steve had a Ranger six-wheeler and Thor had a Yakama Grizzly so if anyone could do it, it would be them. Not being an avid four wheeler guy it always amazes me how far you can take them up a mountain and the height of the vegetation that they will roll over. (L to R) Bryan and Jack with Bryan's 42" moose. Happy times! Not seeing anything up the south fork we headed back to camp about an hour before dark. When we arrived Jack and Bryan where in camp and told us that Bryan had shot the moose. It was Bryan’s first moose, a 42 incher. He was pretty excited. They said Thor, Steve and Hanna were trying to get the rigs across a draw to keep the moose packing to minimum. Around dusk they showed up and told us that they couldn’t make it from this side of the draw but thought they could by starting farther downstream. They were going to try again the next morning. They had gutted and quartered the moose and had him ready to be loaded onto their rigs. Stopping to glass the area as we head up the mountain. With rain showers in the background we are headed off the mountain. (L to R) Jared, Nate, Sagen, Nathan, Rachel and yours truly. Day four started out as another beautiful day so we decided to head back up the north fork using an old four wheeler trail that not only took you farther back in the valley but also took you about half way up the hillside. This opened up more great looking caribou country. We stopped numerous times to glass and around lunch time the boys spotted some Willow Ptarmigan and had some fun hunting them with their .22 cal. pistols and Jared’s new Ruger 10/22 Takedown that he had won in a raffle at the Ducks Unlimited Banquet. We continued on up the hillside knowing that any moment we would spot a big caribou bull. We made it to the end of the trail which was about a mile and a half up the north fork. We could see rain showers moving up the valley so we decided to head back down. About half way down it started to blow and rain pretty hard so we pulled over and set up a big tarp using the four wheelers to tie down the corners. We sat under the tarp and started glassing. Other than a cow moose that Sagen spotted, there was nothing else. After an hour under the tarp and not seeing anything we decided to head back to camp. Sagen stayed back an hour longer hoping to see at least a bull moose join the cow so he could go tell Thor. Exactly what we were looking for, a great caribou. A friend of mind took this photo a few weeks before. It will score close to 400, the minimum to make the B&C Record Book. After the rain stopped we climbed our spotting hill to continue glassing. After an hour or so I decided to head down and get supper started while Sagen stayed back watching until the last light. That’s where we pick up at the start of the story. I turned off the stove, grabbed my rain coat, binoculars and range finder. Everyone was scrambling around grabbing what they thought they would need. Sagen and Rachel took the lead with me right beside them and we all headed across the dry creek bed. We climbed a ten-foot bank to get out of the creek bottom. For some reason I thought the caribou would be on this bench but Sagen said it was the next bench up which was another 50 yards across and another 100-foot climb through the alder. The light was really bad and it was almost dark in the shadows. Once we reached the top of the next bench we were all wet from sweating plus the moisture from the wet brush caused by the rain. In order for us to see a caribou through the scope, it would have had to have been less than 50 yards in front of us. They however, were nowhere to be found. No one but Sagen had seen them. Maybe if we had been 15 minutes earlier. “Who knows,” but it was quite an adrenaline rush. We hung around the bench for another 15 minutes watching the white wings of fifty or so Ptarmigan landing all around us and then headed back to the tents using flashlights. Supper consisted of fried chicken and Ptarmigan which goes well together. It was Nate’s first time eating Ptarmigan and he thought it was pretty tasty. Rachel’s time in Alaska was limited as she had to get back to school and she also wanted to spend some time with her mother. However, she decided to stay for a couple more days hoping to at least see a caribou. Rachel had already taken a moose in this area a few years before and had also taken a sheep and black bear when she was younger but had never killed a caribou. She wanted one really bad. I had to take this photo, Rachel looking for the "pot of gold." The next day we headed back to the creek bank that we used to glass the south fork. Late in the afternoon we spotted a lone grizzly walking down a small drainage about two and a half miles in. He disappeared and after talking to Rachel about shooting a grizzly we decided that maybe we should come back up the next morning and hike in a couple miles to see if we could find him. We headed back to camp for supper and a night around the campfire. Everyone loves telling & listening to stories around the campfire. The bull moose that Sagen called in after it came around to get our wind. Stopped for a break. (L to R) Jared, Rachel, Nate and Nathan. The following morning we were up early and headed back to where the north and south forks split. We parked the rigs and spotted for about a half an hour before starting our hike up the south fork. The only thing we spotted was a lone bull moose so we headed up the creek. The creek bed was dry and the walking was easy. We were close to the two-mile mark when Sagen spotted another bull moose walking on the far side of the creek. We hid along the trail in a small patch of willow and Sagen started calling him in. Initially he stayed on the other side of the creek bed but continued to come our way. Sagen called him in to within 60 yards of us. He strode right by and then crossed the creek bed to try to come around us and get our wind. The moose was only 44-45 inches but he had four brow points which made him legal without a permit. Since we were only hunting caribou we didn’t bring a moose harvest ticket which is all you need for a legal moose in this area. Besides, all of the grandkids had already taken a moose that size and for me the two mile pack was another reason not to shoot him. Calling him in was fun but we still needed to spot a grizzly or a caribou. We hiked for another mile and then stopped to glass and have lunch. Around 1:30 p.m. Sagen spotted a grizzly about 500 yards from us. We were hoping it was the boar that we had spotted the day before but after watching fifteen minutes or so two small cubs appeared. We had fun watching them play through the spotting scope but they were the only bears we saw. About 3 p.m. with no caribou or bear in sight, we decided to hunt back toward the four wheelers. My granddaughter Rachel on our way back to the four wheelers. On the way out we ran into the two moose that we had spotted going in. They had joined up and another hunter had hiked back our way and had spotted them. We passed by him and within 30 minutes later we heard shots so we assumed he had shot at least one of them. Before we made it back to camp our Ptarmigan hunters ended up chasing and shooting more Ptarmigan. That always makes for a fun day. Rachel and her dad glassing from our spotting hill. I love this picture. Even though we didn’t see any caribou or the lone grizzly we had a super day. We glassed from our spotting hill behind camp until dark and then had a delicious freeze dried dinner. We got the fire going and made plans for pulling the camp and getting Rachel home to visit her mother for a couple days before she headed back to school. We did a quick look around the area for caribou the next morning and seeing none packed up to leave. By mid-day we were headed down stream to main camp. The plan was to get Rachel and Nathan back to the vehicles early enough so they could get home at a decent hour. Bryan and Jack helping load the Ranger. It's a big job taking care of a moose. Thor coming off the mountain with a load of moose meat. When we arrived at main camp we found out that Steve and Thor were able to get both machines right up to the moose for an easy pack. That was the only moose they had spotted so they were planning to stay one more day. Sagen and I went with Rachel and Nathan to help them load the four wheeler on the trailer and get them safely on their way and then rode back in to help Thor and Steve look for moose or help pull camp, whichever they wanted. The next morning however, they decided to leave so we spent the morning tearing down the giant tent and packing the tremendous amount of gear in the trailers for the trip out. Our group made it to the vehicle parking lot close to 2:30 p.m. We loaded the four wheelers and our gear on the trailers and were on our way to Anchorage at 4:00 p.m. Even though Rachel didn’t get her caribou, we had another wonderful family hunt. Great memories! Rachel got drawn for caribou again this year so we plan on being out there “looking for her elusive caribou” this coming fall. God is good!